Last weekend beautiful city of Lubawa in Poland hosted Polish national Championships for cadets in Point Fighting and Light Contact. 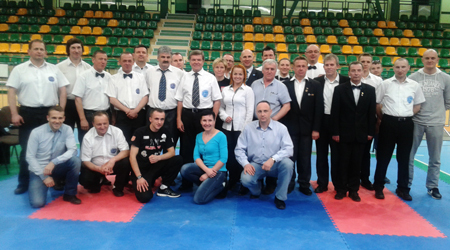 During this event Polish kickboxing federation organized referee seminar for ring sports. About 30 referees attended seminar which was leaded by Dr Borislav Pelević, WAKO Europe President who was WAKO IF Referee Committee Chairman for ring sports for long time. Dr Borislav Pelević also took a chance to have meeting with President of Polish kickboxing federation, Mr. Andrzej Palacz. Dr Pelević was very satisfied with high level of organization of Polish federation, quality of fighters who participated in Championships and of course, number and educational level of referees attending seminar. At the end this was very successful visit to one of WAKO Europe members and special thanks for this weekend goes to Mrs. Katarzyna Kociszewska, WAKO Europe Board member, who was in charge of whole organization. On last March 07, 2014, City of Budva and hotel „Splendid“ hosted 6th edition of „Splendid Grand Prix“, Wako Pro event that has always been known for its glamorous style and high level organization. This time it was even better than before. Main event was World title bout in low kick, 88.600 between Ivan Strugar from Montenegro, former Wako Pro World Champion and Kirill Ivanov from Russia, current Wako Pro European Champion. Beside this main event, we could see four very good prestige fights with fighters from Macedonia, Serbia and Montenegro involved in it. World title bout was not one of the „epic“, „historical“ fights, not even one of the best and highest quality level fights, not one of the fights that will be talked about for years and years. It was very emotional, very tough fight for both of pretenders on World title. Probably that was the reason why they could not give their best to fight and win the title. But, this fight will be remembered as the last conquest of warrior, real and unique WAKO and Wako Pro Champion Ivan Strugar. He started his amateur career back in 1994 on European Championships in Portugal and carried on till 2001 when he finished it winning his third gold medal on World Championships. He won his first Wako Pro title back in 1998 in Belgrade against great Italian champion Danielle Petroni and then in following years he took Wako Pro titles in 78 kg, 81.4 kg, 85 kg and 88.6 kg. First round of the fight was not the one that was expected, slow and curious but was very „dirty“ with a lot of holding, clinching, pushing brought to us, on first place, by Kirill Ivanov, which made referee, Zoran Simurina from Serbia, to give him verbal warning in opening round. Second one was almost the same like first one, only the fact that Ivan Strugar accepted this way of fighting and „spoiled“ our fun. Third round was the one where we could see some real action and some points made by Ivan Strugar with his kicks. Kirill Ivanov was the one who started fourth round strong and aggressive winning some points but then he got one minus point for clinching and pushing. On the other side Ivan Strugar got warning for holding. The last round brought to us again the same style of fighting. 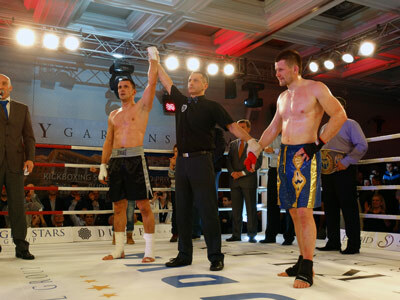 Kirill Ivanov was the one who was behind and he had to push it forward and try to win the fight by knock out. Desiree was just too big for him and he started again with very „dirty“ fighting which made referee to penalize him with another minus point. Because of holding Ivan Strugar also got one minus point. At very end of the fight Kirill Ivanov tried to do something more but Ivan Strugar was just too ready for that and did not let him even make a small doubt about the result. At the end hands of Ivan Strugar raised high in the air celebrating decision we all expected base on what was seen in all five rounds. 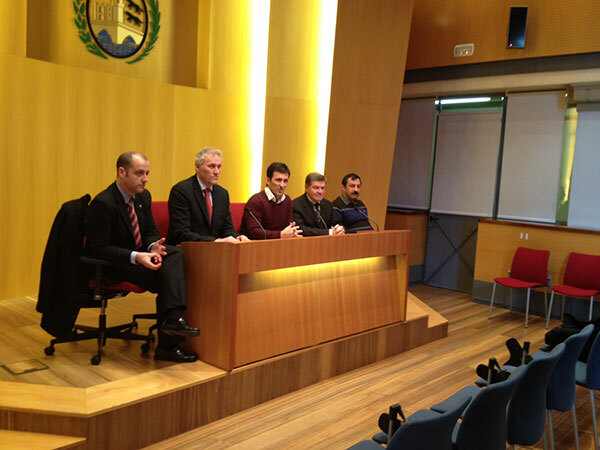 The next WAKO European Championships for juniors and cadets will be held 2015th in the city of San Sebastian in Spain. Preserving the good practices of the high level organization of kickboxing championships, WAKO Spain has accepted very delicate job to promote next European Championships for juniors and cadets. Knowing the big number of participants of this kind of championship and what are the needs of this age group of competitors, our WAKO friends from Spain will have to work really hard to make another great WAKO event. As part of journey to Spain, WAKO IF officials, Mr. Espen Lund, Mr. Borislav Pelević and Mr. Salim Kayici, had the opportunity to check how preparations are going for the next European Championship in 2014. and also to make a visit to the city of San Sebastian, which will host next year European Championships for juniors and cadets. 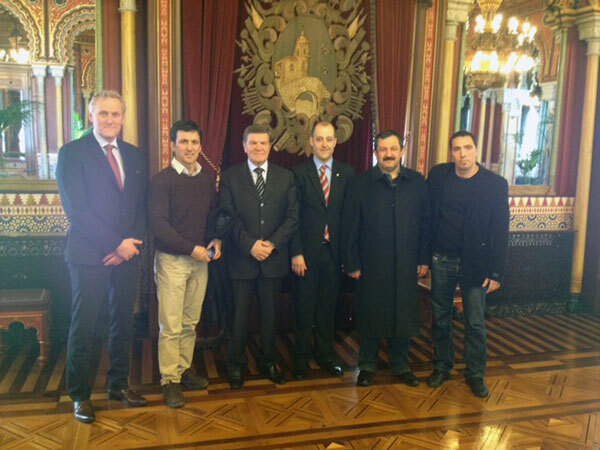 On arrival to San Sebastian, WAKO officials had a pleasure to visit beautiful City Hall of San Sebastian where they met Mr. Juan Carlos Izaguirre, Mayor of San Sebastian and Mr. Joze Ruiz, councilor of San Sebastian. 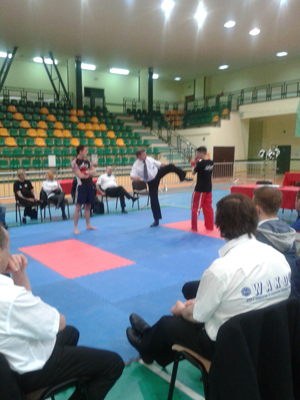 They have introduced to WAKO officials all work done so far for promotion of European Championships. After the meeting held in City Hall, WAKO officials had a chance to see a little bit of San Sebastian and also to visit three sport venues which are very good. One of them will be selected to host European championships next year. If we bear in mind that the configuration of this place is small because it is a typical Spanish seaside town, the promoter will not have a lot of headaches about transportation of athletes and officials from the hotel to the hall because everything is very close to one another. San Sebastian offers to its visitors a complete pleasure during their stay. Obviously, the young competitors, certainly will find time to get acquainted with this touristic pearl, with its history, museums, architecture, monuments, festivals in order to fully understand why this is one of the most popular Spanish tourist destination. And while San Sebastian, or Donostia, as its inhabitants originally called it, is preparing to become the European Capital of Culture for 2016, let this great WAKO event become a prelude for it. In the north of the Spanish province, Basque Region, is a nice little town known for its big waves and prestigious film festival. In San Sebastian tourists come from all over the world. In the evening, the streets of the old part of the city, are full of people and everything is crazy and lively. View of the Atlantic Ocean is a wonderful and unforgettable. San Sebastian, Donostia in Basque, is located 20 km west of the French-Spanish border. San Sebastian is the third largest city in the Basque Region and has about 150,000 residents. It is famous for its film festival and beaches. The most famous is certainly the “La Concha” (seashell) beach in the same bay. On the right side of the mouth of the river Urumea is the beach Zuriola. Landscape is also dominated by Monte Igeldo, Monte Urgull and the island of Santa Clara. Despite the fact that the main source of financial income is tourism, the city does not encounter madness typical of mass tourism. On the contrary, everything goes to its slow tempo. It seems that tourists are always ready to adapt this rhythm, because Donostians are not willing to change their lifestyle in order to please the tourists. Our visit to Spain and the city of Bilbao, in order to check how preparation for upcoming WAKO European Championships is going on, was more than satisfying because of the job already done by promoter. Moreover, we got impression that, beside the fact that technical organization of Championships will be on very high level, we will also have Spain as real, good and honest host for all of our members participating in this great WAKO event. These are the first impressions that we, Mr. Espen Lund (WAKO acting President), Mr. Borislav Pelevic (WAKO Europe President and WAKO IF Vice-president) and Mr. Salim Kaiyci (WAKO IF Executive Board member and WAKO Europe Vice-president) had ​​after successful journey to Spain. 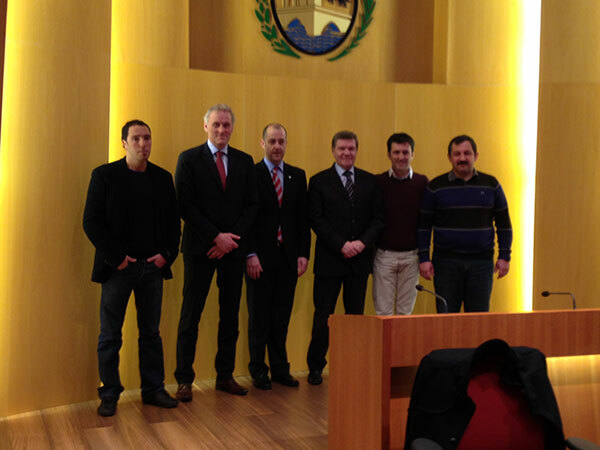 WAKO promoters of this region, Mr. Mendioroz Borja, Mr. Jose Vicente Eguzkiza and WAKO Spain President, Mr. Juanjo Rodriguez were our kind hosts at the first visit to the City Hall of Bilbao. 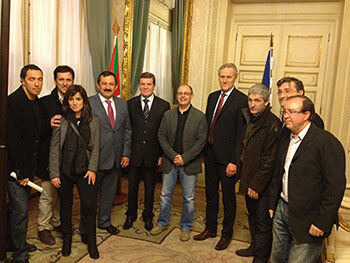 After very constructive meeting with Mrs. Sabin Anuzita, Bilbao Councilor of Sports, we had a press conference for local media in which we could see that there is significant interest in this event which will take place in October 2014. City of Bilbao offers a great possibilities concerning hotel accommodation. Sport hall in which Championships will be organized has all necessary facilities for hosting such a big event with huge number of participants. Hotels are very good, distance between hotels and sport hall is that kind that requires simple logistics when it comes to transportation. After the presentation of the planned hotel for accommodation of all participants and sport hall, WAKO Spain, as promoter of next WAKO European Championships has got “green light” for their future work. Despite the fact that they had relatively short time, promoters, the City Government of Bilbao and the Basque Region made a great job so far. Because of that we can all be sure that next WAKO European Championships will be another great WAKO event. The beauty of Bilbao and the Basque Region in general is well known all around the World. We will have the privilege to enjoy in it.